A former Dutch cargo barge, the 1928-built Hirondelle was transformed into a hotel in 1992 (and was refurbished again in 2002). 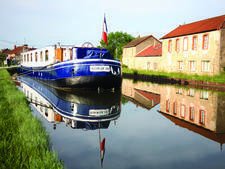 The eight-passenger Hirondelle cruises in Southern Burgundy and Franche-Comte, France, a region known for its vineyards. Accommodations include four roughly 100-square-ft. cabins. Three cabins feature twin beds, and the fourth has a double. Bathrooms are shower-only, and include Occitane soap, shampoo and shower gel. 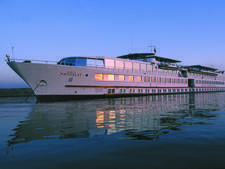 Cruises typically include all meals with local wine (and a French cheese board), all shore excursions (a guided tour in Besancon, birthplace of Victor Hugo, for instance), an open bar and bikes for passenger use. Optional excursions, including hot air balloon rides and golf, are extra. Public spaces include a saloon, and a sun deck with sun loungers and hot tub. The ship features air conditioning throughout. The four-person crew is comprised of a skipper, chef, tour guide and hostess. The four-passenger Alouette cruises in Provence, France, along the 17th century Canal du Midi; many of its sailings are available for charter-only. Road To Mandalay has been sailing in Myanmar since 1996; it's an elegant vessel with a light and airy decor, complemented by antiques and local carvings. 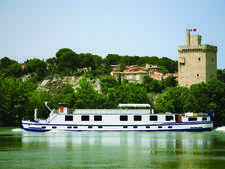 The 12-passenger Napoleon hotel barge sails the Rhone between Arles and Tain l'Hermitage/Tournon. Starting with a 1962-built Dutch hull, the eight-passenger Amaryllis was converted into a hotel barge in 2001. 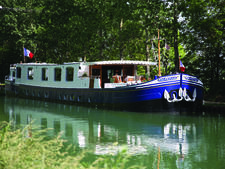 The barge offers cruises around Dijon, and on the Canal de Bourgogne and River Saone. The six-passenger Fleur de Lys is an all-inclusive product; wines, soda, bottled water, beer and liquor are part of the fare. Shore excursions are also part of the package.